Adoptive immunotherapy with cytotoxic T lymphocytes (CTL) represents an alternative approach to treating solid tumors. Ideally, this would confer long-term protection against tumor. We previously demonstrated that in vitro-generated tumor-specific CTL from the ovalbumin (OVA)-specific OT-I T cell receptor transgenic mouse persisted long after adoptive transfer as memory T cells. When recipient mice were challenged with the OVA-expressing E.G7 thymoma, tumor growth was delayed and sometimes prevented. The reasons for therapeutic failures were not clear. 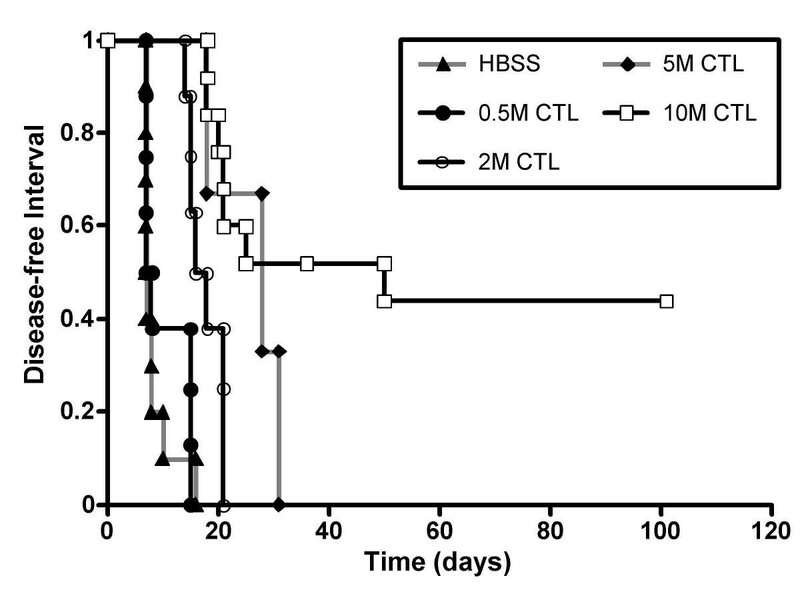 OT-I CTL were adoptively transferred to C57BL/6 mice 21 – 28 days prior to tumor challenge. At this time, the donor cells had the phenotypical and functional characteristics of memory CD8+ T cells. Recipients which developed tumor despite adoptive immunotherapy were analyzed to evaluate the reason(s) for therapeutic failure. Dose-response studies demonstrated that the degree of tumor protection was directly proportional to the number of OT-I CTL adoptively transferred. At a low dose of OT-I CTL, therapeutic failure was attributed to insufficient numbers of OT-I T cells that persisted in vivo, rather than mechanisms that actively suppressed or anergized the OT-I T cells. In recipients of high numbers of OT-I CTL, the E.G7 tumor that developed was shown to be resistant to fresh OT-I CTL when examined ex vivo. Furthermore, these same tumor cells no longer secreted a detectable level of OVA. In this case, resistance to immunotherapy was secondary to selection of clones of E.G7 that expressed a lower level of tumor antigen. Memory engraftment with tumor-specific CTL provides long-term protection against tumor. However, there are several limitations to this immunotherapeutic strategy, especially when targeting a single antigen. This study illustrates the importance of administering large numbers of effectors to engraft sufficiently efficacious immunologic memory. It also demonstrates the importance of targeting several antigens when developing vaccine strategies for cancer. Cytotoxic T lymphocytes (CTL) represent attractive immunotherapeutic effectors for cancer, as they are specific and potent killers of all cells that bear the target antigen in the context of a class I MHC molecule [1–4]. However, like other immunological strategies, they infrequently effect cure of established tumors. Rather, tumor-specific CTL are most likely to succeed in the presence of minimal disease, where the primed immune effectors keep the disease at bay or eliminate residual malignant foci. To utilize CTL in this way, they must survive for long periods after adoptive transfer as memory cells, ready to mount a response at the earliest sign of recurrence. Recently, we described a mouse model in which tumor-specific CTL generated in vitro persisted long after adoptive transfer into syngeneic mice, with the phenotypic and functional characteristics of memory cells . In this model, we utilized CD8+ T cells originating from OT-I T cell receptor (TCR) transgenic mice that recognize ovalbumin (OVA) in the context of class I MHC molecules. While adoptive transfer of OT-I CD8+ T cells conferred long-term protection against the OVA-expressing E.G7 thymoma, complete protection was not observed. The reasons for the limited therapeutic efficacy of adoptive immunotherapy targeting a single model tumor antigen were explored. OT-I TCR transgenic mice  were maintained by breeding heterozygous OT-I TCR transgenic mice to wild-type C57BL/6J mice. The progeny were screened by PCR for the expression of the TCR transgene. All recipient mice were C57BL/6J mice aged 6 – 9 weeks, purchased from Jackson laboratories (Bar Harbor, ME). Mice were treated in accordance with the guidelines established by the University of Miami Animal Care and Use Committee. EL-4, a thymoma that was derived from the C57BL/6 mouse (H-2b), was obtained from the American Type Culture Collection (ATCC; Rockville, MD). E.G7 cells are EL-4 cells transfected with OVA cDNA , and these were a gift from Dr. M. Bevan (University of Washington, Seattle, WA). These cell lines were maintained in complete medium (CM), consisting of RPMI 1640 containing 5% FCS, glutamine (30 μg/mL), penicillin (100 U/mL), streptomycin (100 μg/mL), and β-mercaptoethanol (5 × 10-5 M). OVA257–264 peptide (SIINFEKL)  was synthesized by Research Genetics (Huntsville, AL). Directly conjugated monoclonal antibodies included Cychrom-anti-CD8α, PE-conjugated anti-Vα2-TCR, FITC-Vβ5.1,5.2-TCR (Pharmingen, San Diego, CA), FITC-anti-CD8α (53.6.7). Antibodies for ELISA for measurement of ovalbumin consisted of anti-chicken albumin and horseradish peroxidase-labeled anti-chicken albumin (Rockland, Gilbertsville, PA). OT-I CTL were generated by stimulation with 1 nM OVA peptide (OVA257–264), IL-2 (50 U/mL) and IL-4 (175 U/mL), as previously described . On the fifth day of culture, OT-I CTL were injected via tail vein in a volume of 0.5 mL HBSS, into normal C57BL/6J mice. Tumor cells (E.G7 or EL-4, 1 × 106 in 0.2 mL HBSS) were injected subcutaneously in the lower abdomen 21 – 28 days after adoptive transfer of OT-I CTL. The tumor cells were freshly thawed within 6 days of inoculation. Cell surface phenotypes were determined by flow cytometry, on a FACScan flow cytometer (Becton-Dickinson, San Jose, CA). CTL activity was measured with a 5-h 51Cr-release assay, using E.G7 and EL-4 cells as targets. T cell proliferation was assessed by thymidine uptake assay. The methods for each of these analyses has been previously described . On the day of adoptive transfer, OT-I splenocyte cultures typically consisted of greater than 90% CD8+ cells that co-expressed Vα2-TCR and Vβ5.1,5.2-TCR. As previously shown, on the day of injection, the activated cells typified effector T lymphocytes. These effector cells were potently and specifically cytotoxic against ovalbumin-expressing targets in vitro . At 21 – 28 days after adoptive transfer, mice were challenged with an ovalbumin-expressing tumor (E.G7). Several doses of OT-I CTL were assessed for their antineoplastic effect. When compared to controls treated with HBSS, a measurable delay in growth of E.G7 was seen in recipients of as few as 0.5 × 106 OT-I CTL. Higher doses were associated with longer disease-free intervals and, in some cases, prevention of tumor appearance (Figure 1). This protection was specific to ovalbumin-expressing tumors, as adoptive transfer of OT-I CTL did not have an appreciable effect on the growth of the parental cell line, EL-4 (data not shown; ref. ). 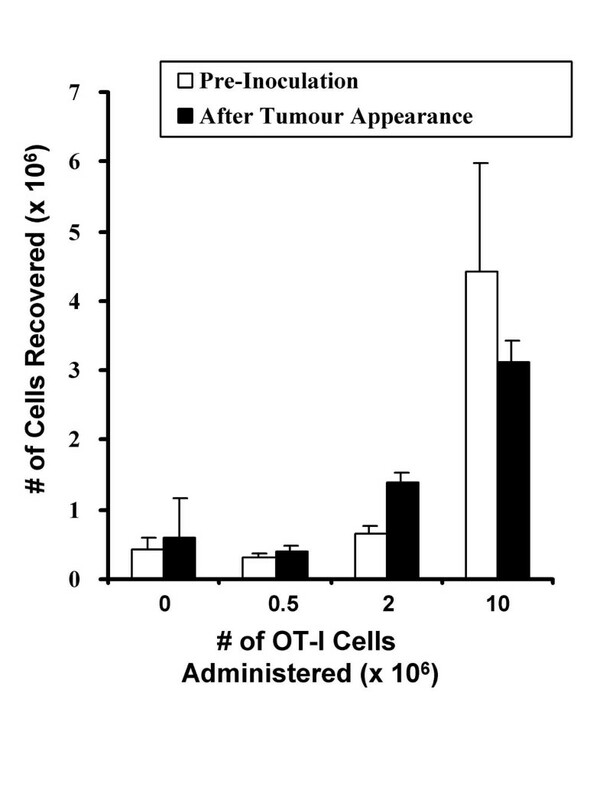 Tumor-free survival of mice which received infusions of various numbers of OT-I CTL and which were challenged with E.G7 tumor cells (1 × 106, sc). Numbers of OT-I CTL that were adoptively transferred are expressed in millions (M). Data are from 8 – 10 mice per group. Potential reasons for failure of protection from tumor following adoptive transfer include insufficient effector-to-target ratio, anergy, or inability of effector T cells to recognize tumor as it progresses. To analyze treatment failures, mice were sacrificed at 21 – 28 days for baseline analysis of the function of persistent T cells, or within two days of developing a tumor measuring 7.0 mm in maximal diameter. OT-I CTL persisting in the spleen and lymph nodes of mice were enumerated by determination of the fraction of cells that were "triple-stain positive" for CD8, Vα2, and Vβ5. At 21 – 28 days, the mean number of "triple-stain positive" cells in control mice treated with HBSS was (0.4 ± 0.2) × 106. 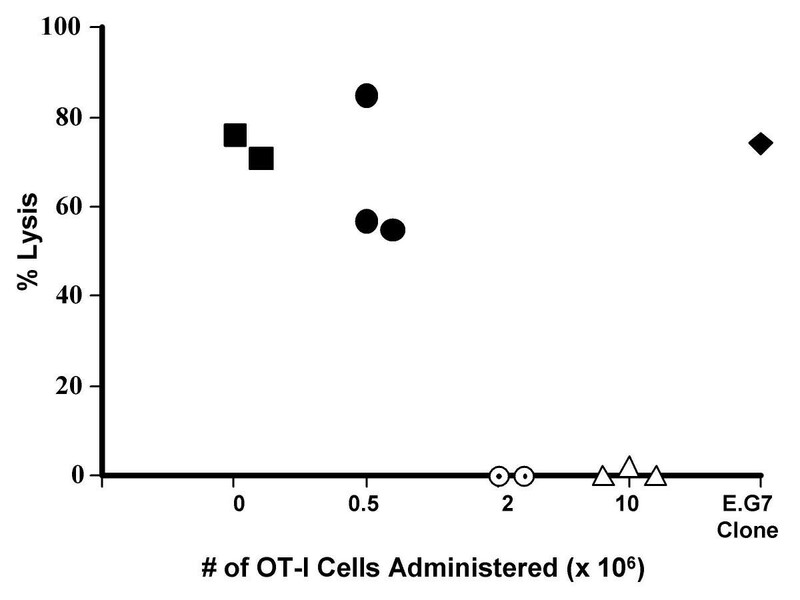 As expected, the number of "triple-stain positive" cells detectable in the spleen and lymph nodes was proportional to the number of OT-I CD8+ cells administered (Figure 2). Therefore, it is possible that insufficient numbers of effectors present at the time of tumor challenge may have been a contributing factor in mice treated with lower doses of CTL. It was also possible that individual recipients which developed tumor had lower numbers of surviving cells than average. However, when the numbers of donor cells recovered prior to tumor inoculation were compared to the numbers recovered at the time of therapeutic failure, there was no evidence that the individuals which developed tumor sustained a significant loss or had a deficiency of donor cells (Figure 2). Therefore, poor viability and loss of tumor-specific effectors in the course of time or in response to tumor inoculation did not appear to be a problem, although insufficient effectors may have been a contributing factor in mice treated with lower doses of CTL. Number of persistent donor cells recovered from spleen and 4 lymph nodes, as measured prior to tumor challenge (ie: Day 21 – 28) and at the time of therapeutic failure. Donor cells were identified by staining for CD8, Vα2-TCR and Vβ5.1,5.2-TCR. These data are the aggregate of 2 – 3 individual experiments per group. The capacity of the OT-I CD8+ cells present in the spleen and lymph nodes to recognize and to respond to tumor antigen was examined in all therapeutic failures. We previously demonstrated that, at 21 – 28 days (ie: prior to tumor inoculation), a vigorous proliferative response is typically seen in vitro following re-exposure to OVA peptide. Moreover, the persistent donor cells respond more quickly and more intensely to lower levels of antigen than naïve T cells . These functional characteristics are typical for memory T cells [8–10]. To determine whether donor cells from mice which developed tumor after adoptive transfer of CTL retained their ability to respond to antigen, splenocytes were similarly re-stimulated with ovalbumin. The magnitude of the response was proportional to the number of OT-I CTL administered (Figure 3). Therefore, while it is possible that individual cells were rendered anergic, generalized clonal anergy was not responsible for therapeutic failures. Proliferative response of donor cells as determined by 3H-thymidine uptake assay. Splenocytes from recipients of OT-I CTL were harvested after therapeutic failure and pulsed with ovalbumin peptide (5 nM). These data are the aggregate of 2 – 3 individual experiments per group. Inability of CTL effectors to recognize individual tumor cells was another possible mechanism for therapeutic failure. Tumors removed from mice treated by various numbers of CTL were tested for their ability to act as targets to freshly generated OT-I CTL. Tumors originating from animals treated with 0.5 million CTL or with HBSS alone remained targets to the OVA-specific CTL. In contrast, tumors originating from animals treated with 2 or 10 million CTL were not lysed by the freshly generated CTL effectors, suggesting that they were no longer targets (Figure 4). Analysis of tumors extracted from mice which failed to reject a tumor challenge after adoptive transfer of various numbers of OT-I CTL. Cytotoxicity of freshly generated OT-I CTL against E.G7 tumor derived from individual therapeutic failures. Data are expressed as % cytotoxicity at an effector-to-target ratio of 100:1. Each symbol represents an individual. To determine whether the degree of antigen expression was responsible for this finding, cells derived from tumors of OT-I CTL recipients were tested for ovalbumin secretion. Tumor cells derived from treatment failures were cultured in standardized conditions and the media were tested for ovalbumin content. 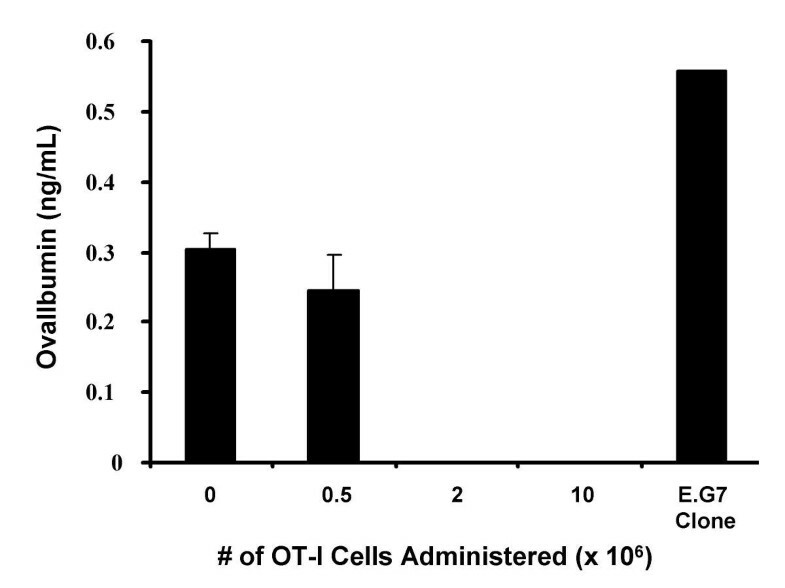 Tumors from mice treated with 2 or 10 millions effectors, which were poor targets by cytotoxicity assay, did not produce sufficient ovalbumin to be detectable by ELISA (sensitivity 50 pg/mL) (Figure 5). To evaluate whether this was due to selection of OVA loss variants originating from the E.G7 cells used to inoculate the CTL recipients, E.G7 cells were cloned to determine what proportion secreted ovalbumin. 96 of 113 clones (85%) secreted sufficient ovalbumin to be detectable by ELISA. Thus, failed immunotherapy likely reflected the outgrowth of those E.G7 that did not obviously express OVA at the time of tumor inoculation. Ovalbumin secretion by E.G7 tumor cells derived from mice which developed tumor after adoptive immunotherapy. Tumor cells (1 × 106) from each individual were cultured in duplicates and supernatants were collected at 24 hours for ELISA determination of ovalbumin content. Data are derived from 2 – 3 mice per group. Several clones shown to secrete detectable amounts of ovalbumin were expanded. 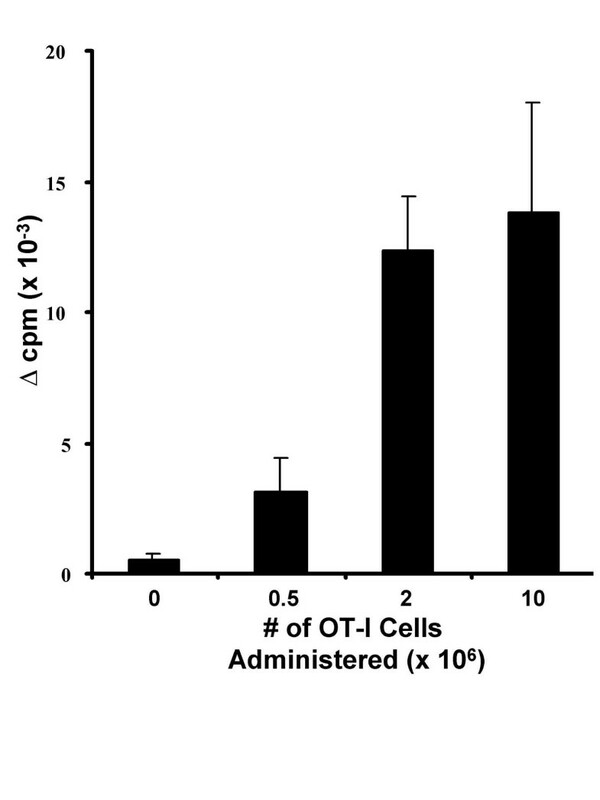 One of these clones was tested in an in vitro cytotoxicity assay using freshly generated OT-I CTL, and it served as an excellent target (Figure 4). Moreover, recipients of 10 × 106 OT-I CTL were challenged with this E.G7 clone. When these freshly cloned tumor cells were utilized as the target, the therapeutic outcome was markedly better compared to mice treated with the old E.G7 cells. Only one mouse in 6 developed tumor and this tumor did not appear until 21 days after tumor inoculation (data not shown). Moreover, OT-I CD8+ T cells primed under various conditions were tested over several experiments; cure rates were generally better when the freshly cloned E.G7 was utilized to inoculate recipients . Altogether, the data suggest that one mechanism of therapeutic failure, typically seen in animals treated with higher numbers of OVA-specific CTL, is selection of tumor cells that produced insufficient amounts of antigen to be recognized by effectors. This mechanism of therapeutic failure did not appear to be responsible for the earlier tumor growth seen in animals treated with low numbers of CTL. Rather, it is more likely that insufficient effector-to-target ratios were responsible for therapeutic failures in these animals. Since a large tumor burden is a potential obstacle to successful immunotherapy, it is likely that the role of immunotherapy will be most pronounced in the presence of minimal disease. Clinically, this strategy might then be best applied as adjuvant therapy following resection or after cytoreductive chemotherapy. Therefore, cellular immunotherapy must be designed to respond to recurrence or progression of minimal disease over a long period of time. This would require engraftment of immunologic memory. While our model does not perfectly reflect the clinical situation of minimal residual disease, it does enable the assessment of how effectively tumor-specific T cell memory engraftment prevents tumor emergence. T cells administered well before tumor challenge persisted long after adoptive transfer and they responded readily to re-stimulation by antigen. Moreover, their in vivo activity was demonstrable by their ability to provide long-term protection against tumor expressing the target antigen, in a dose-dependent manner. Unfortunately, even in what appeared to be an idealized experimental situation, responses were incomplete and nondurable. This was secondary to a very powerful selective influence, culminating in the emergence of antigen-loss variants. According to the immune surveillance theory, cancer arises when the immune system is unable to recognize individual cancer cells, enabling them to escape detection. While this postulate does not completely explain the pathogenesis of cancer, escape from the immune system is an important factor. Indeed, tumor cells escape by a number of mechanisms. Peripheral tolerance to tumor antigens may exist [11, 12]. Immune precursors may be ignorant of tumor because of malpresentation , MHC downregulation [13, 14] or insufficient antigen expression [15, 16]. As tumor evolves, the immune system sequentially and consecutively eliminates cells expressing certain antigens in order of degree of immunodominance [16–19], diminishing tumor immunogenicity. MHC downregulation appears to be particularly detrimental to the anti-tumor immune response, as this results in permanent escape from immune detection . Even when tumor cells are recognized by effectors, a number of processes may interfere with their clearance. For example, insufficient costimulation or other mechanisms may lead to anergy  or blunted responsiveness of tumor-specific effectors [21, 22]. Induction of apoptosis of potentially hostile lymphocytes by tumor has also been described [23–25]. Thus, in addition to escape from detection by the immune system, tumor may directly influence immune effector function. Some of the mechanisms that enable escape from the immune system in its natural state may also be responsible for treatment failures following immunotherapy. In the idealized experimental system described in the present work, therapeutic failures predictably occurred when effector-to-target ratios were insufficient in vivo. This problem was easily overcome by administration of greater numbers of activated CTL. However, in the clinical situation, where CTL are generated in non-transgenic individuals, generation of such high numbers of CTL may be problematic. When vaccination strategies are employed (using modified tumor cells or dendritic cells, for example), generating sufficient numbers of CTL may be particularly difficult, even following booster vaccinations. It will therefore be imperative to get a better understanding of the factors that improve survival of tumor-specific CTL and enhance differentiation to memory cells. A second important limitation of adoptive immunotherapy that became apparent in the presence of higher effector-to-target ratios was selection for antigen loss variants. It may be argued that the model described in the present paper is not truly reflective of the situation seen with a normal cancer cell. That is, the E.G7 cell has been transfected with a foreign gene that has inherent instability and this may be responsible for the antigen loss. On the other hand, data from others have shown that, in general, cancer cells are typically genetically unstable. As seen in the adenoma-colorectal cancer sequence, by the time of clinical manifestation, many tumors have accumulated thousands of mutations [26–28]. As a result, antigen expression would be expected to be heterogeneous in any given tumor. Therefore, in the model presented (where 85% of input cells expressed the target antigen), the heterogeneity of tumor cells is probably considerably less than what might be expected in the real situation, emphasizing the magnitude of the problem of emergence of antigen loss variants. Targeting a single antigen is not likely to succeed unless that antigen is necessary for the function and survival of the cancer cell. This situation is rare, although one example is BCR-ABL, a constitutively activated tyrosine kinase that causes chronic myeloid leukemia (CML). Targeting such a protein, albeit pharmacologically, has met with therapeutic success . In the absence of an appropriate pharmacological agent, targeting such an antigen immunologically would be expected to be successful. Unfortunately, few such targets have so far been identified and so other strategies are required to overcome the problem of emergence of antigen loss variants. Undoubtedly, targeting multiple antigens will ameliorate part of the problem [30–32], although the probability of success with this approach has not yet been quantified. Another potential solution is the concomitant utilization of approaches with more bystander effect. For example, MHC non-restricted effectors such as NK or LAK cells may be helpful [33, 34], particularly in tumors where loss of MHC expression has occurred. Alternatively, biological response modifiers or cytotoxic agents could be administered concomitantly. The problem of emergence of antigen loss variants is therefore not insurmountable. We have demonstrated two obstacles to success with tumor-specific CD8+ memory T cell engraftment. Firstly, sufficient persistence of functional tumor-specific CTL over long periods will prove a potential problem in non-transgenic individuals and when vaccination strategies are utilized. Secondly, targeting a single antigen by cellular immunotherapy is not likely to be successful because of selective emergence of antigen loss variants. While we are certainly not the first to describe antigen loss variants [15, 35, 36, 16, 37], this study is important in that it demonstrates unequivocally the magnitude of the problem, even in an idealized experimental system, in the presence of minimal disease burden. This is especially topical given the number of vaccines in development and in clinical trials that are reliant on a single antigen expressed by a given tumor. Clearly, targeting multiple antigens is essential to success. Moreover, treatment with multiple therapeutic modalities may prove to be best. We thank Aixin Yu and Paul Scibelli for technical assistance. This research was supported by the Department of Defense (DAMD17-98-1-8208) the National Institute of Health (R01-AI40114). OFB performed in vivo experiments, carried out in vitro functional studies and flow cytometry, and drafted the manuscript. NDH developed the model system, and carried out a proportion of the animal studies and flow cytometry experiments. TRM and OFB conceived of the study and designed the experiments. All authors read and approved the final manuscript.